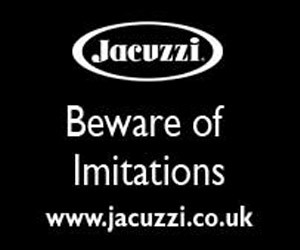 Iconic hot tub manufacturer Marquis has increased its provision of Aquatic Training Vessel options with the introduction of new powerful technology to boost its fleet of swim spa models for the New Year. To build on its first foray into the swim spa market and to provide its global network of dealers with unique Aquatic Training Vessel (ATV) design features and extra model choice to supply to their customers, the Oregon-based manufacturer has now extended its options to include the ATV-17 Kona, ATV-17 Sport, ATV-14 Sport and the ATV-14 Splash. Since launching its first ATV-14 to British audiences this year at the UK Pool & Spa Expo and SPATEX and gaining its inaugural WhatSwimSpa? Best Buy Award accolade for the new ATV-Ultimate concept design in the £22,500+ price bracket of the 2015 edition of the consumer magazine, the manufacturer has hit record-breaking sales for its hot tub and swim spas and is now preparing to continue the momentum into 2016 with its new additions to its ATV fleet. In the WhatSwimSpa? Verdict the ATV Ultimate is praised for being ‘great value from a quality manufacturer’. 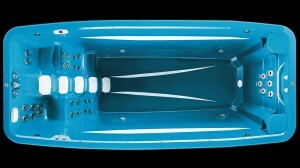 It also highlights that the ATV’s distinctive bowed sides design feature incorporated by Marquis provides dealers with unique aspects to promote to consumers in the swim spa market by stating that ‘the unique bowed side profiles of the ATV are more than just a stylised design feature as they allow for a more spacious swim and workout space at the points where extra space is needed most’. This extensive exhibition tour by Marquis has fuelled extra demand for the ATV; along with the manufacturer’s collaboration with six-time Ironman World Champion Dave Scott, the First Inductee to the Ironman Hall of Fame, to provide online exercise guidance for ATV owners with a dedicated swim spa training section on its website. The new ATV-17 Kona comes in at 518 x 227 x 155cm has been introduced as the largest option in the fledgling swim spa fleet and comes with complete access to the full library of videos and workouts and swim sets plus reference materials from Dave, who also achieved three Ironman World Championship Silver Medals. Along with Marquis’ all new Whitewater 4 Jets, the Kona provides seventeen feet of pure power. Paired with two new 360 GPM 2-speed pumps, six Whitewater 4 Swim End jets deliver 39 per cent more flow than traditional jets of a similar size. According to the manufacturer, when it is cranked all the way up to maximum output, the Kona will deliver an open water swim experience much like the swim off Kona on the Big Island of Hawaii; which has witnessed legendary Gold Medal-winning Ironman World Championship performances by Dave Scott, as well as his epic battles with fierce rival Mark Allen, including their 1989 encounter that has been dubbed the ‘Ironwar’ and the ‘Greatest Race Ever Run’. Another Marquis innovation for the Kona is the positioning of two Whitewater 4 Buoyancy Jets on each side of the vessel deep down below the water level, which are powered by the manufacturer’s MP160 2-speed pump. The ATV-17 Sport, like the Kona, is three feet longer and five inches deeper in workout area than the original ATV. Designers have ensured that the 53” depth of water will make physical therapy and other upper torso aquatic exercise even more beneficial. This extra three feet of length offers even more swim workout space to maneuver as well. 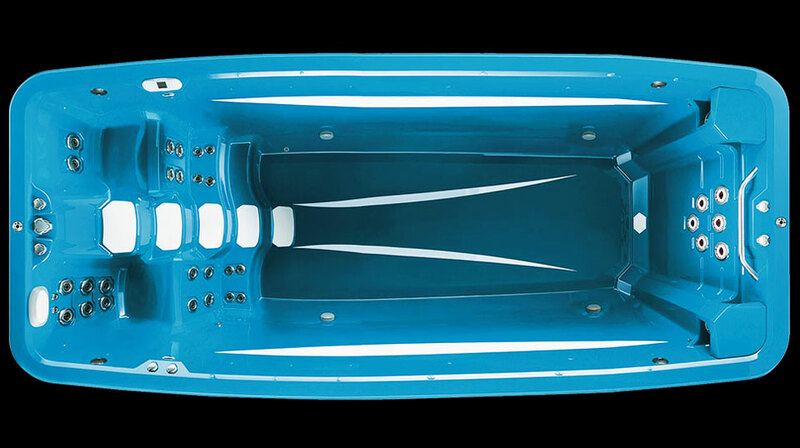 The ATV six jet array at the swim end and three 2-speed pumps will power the substantial flow of water through the space as well as the therapy jets in the two seats. To build on the success of its predecessor, the ATV-14 Sport is similar to the original, coming in at 428 x 227 x 143cm, but enhanced for dealers to achieve further success in 2016. It features twin tether anchor locations for workouts both against and with the flow of the water. This simple change of direction for water movement provides differing stroke, kick and body orientation to improve swim mechanics. As an extra option for dealers and their customers with lower budgets, the ATV 14 Splash provides all of the functions of the ATV 14 Sport, just with a little less flow intensity and cost. A single pump has been incorporated into the design to power two swim end jets and this model option also includes one swim tether for aquatic exercise. Marquis is known for its unique interior colour choices and the latest ATV fleet additions have not been left out and are being produced with a choice of three stunning colours. All four models are now available in Frost White, Ocean Blue and the new colour option for 2016 of Sky Blue. Marquis President & CEO John Schrenk has welcomed the latest additions to the ATV fleet and highlighted that the new designs have been produced to provide dealers with options to satisfy the demands of competitive athletes and owners with family members who have various swimming and exercise capabilities. “We have expanded our ATV line to meet the growing demand for a variety of customers, from the serious athlete to a family looking to spend time together,” he said.